With less than a year to go, how are preparations going? Who is running? What will be the key issues? 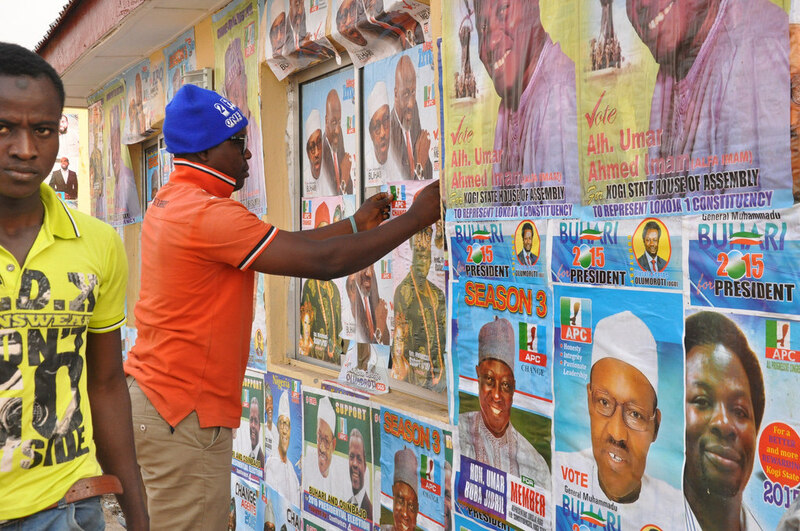 Campaigning in the Nigeria elections in 2015. Credit: Heinrich-Böll-Stiftung. It is now less than a year before Nigeria’s critical general elections. In those polls, currently scheduled for 16 February and 2 March 2019, tens of millions of citizens will vote in what could be some of the country’s most fiercely fought contests yet. How are preparations going? Who is running? What will be the key issues? Since Mahmood Yakubu took over as chair of the Independent National Electoral Commission (INEC) in 2015, the body has carried out over 167 elections. One was nullified in court. INEC has also undertaken several institutional reforms. This includes launching a new strategic plan, working on a youth engagement strategy, and reviewing its gender policy. It has promoted deserving staff and, in an unprecedented move, prosecuted officials found to have committed wrongdoing in the 2015 elections. Ahead of 2019, the commission has set up a committee to review the voting process and transmission of tallies. For the first time since the return to democracy in 1999, INEC is also conducting continuous voter registration. Despite these giant strides, however, the body is facing some challenges. Because of delays caused by a dispute between the president and Senate, for example, INEC still only has 30 out of 37 Resident Electoral Commissioners, the key officials responsible for organising elections at the state level. Continuous voter registration, which opened in 2016, has also experienced glitches, with some citizens complaining of being unable to register. This led INEC to recently deploy additional registration machines and increase the number of registration centres to 1,446 nationwide. Meanwhile, the cost of running the elections may also present a challenge. This is especially the case given that Nigeria has just exited a recession. The commission has also been given additional headaches following last month’s local elections in Kano State. In the aftermath of that poll, a video emerged showing young children thumb-printing ballot papers. INEC did not oversee that election, but some claimed it had been responsible for registering the underage voters in the first place. In response to this criticism, the commission set up a panel to probe the alleged underage voting and examine the nearly 5 million voters on the register in Kano. INEC has previously helped other countries in West Africa clean up their electoral registers, most recently ahead of Liberia’s run-off polls in December 2017. In the 2015 elections, Nigeria had 40 registered political parties. Ahead of 2019, there are now 68, with 33 more being considered for registration. The ones to beat this time around will be the ruling All Progressives Congress (APC). This party was created ahead of 2015 through a merger of what were then the country’s four biggest opposition parties. Its growing ranks were further boosted when several figures from the People’s Democratic Party (PDP), in power at the time, crossed the floor. In the election, the APC enjoyed an historic victory and ended the PDP’s political dominance, which had lasted since 1999. But since those heights, internal rivalries have come to the fore and prevented it from emerging as a cohesive force. The APC continues to run as an amalgam of the interests that created it in the first instance, with intra-party disputes emerging at both federal and state levels. The incumbent President Buhari is the front runner to be the party’s flagbearer in 2019. However, aside from his mixed record in office, his advanced age of 75 and ill health could arise as an issue. Many are asking whether he will be fit to govern if re-elected, especially given that he spent several months of his first term receiving treatment in London for an undisclosed ailment. The main opposition PDP has faced similar infighting to the APC since 2015. After the election, the party faced a bitter legal battle over the leadership of the party with Ahmed Makarfi eventually confirmed as the party chair. Since then, the PDP has held a national convention in which new officials were elected. Some regions were marginalised, however, and the party has yet to calm concerns about the state of its internal democracy or shed its reputation for corruption, which it developed over its 16 years in office. Several candidates are lining up to bid to be the PDP’s presidential nominee. They include former Vice President Atiku Abubakar, who recently crossed over from the APC. Often described as a serial defector, Atiku has commenced consultations and is regularly voicing his opinions on policy matters. At 71, his age and unproven corruption allegations remains the albatross around his neck. 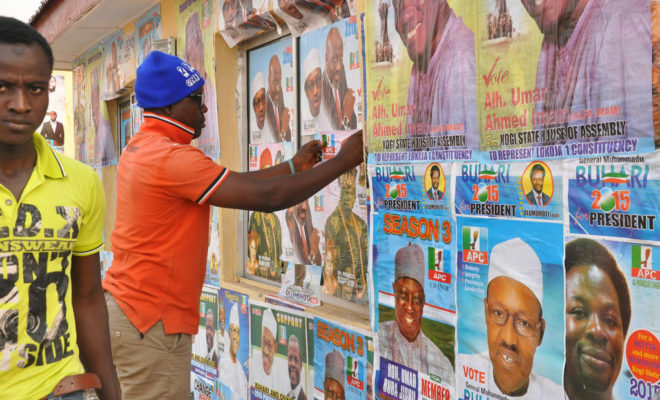 Other aspirants from the PDP include controversial governor of Ekiti State, Ayodele Fayose, and former governors of Kaduna and Jigawa, Ahmed Makarfi and Sule Lamido respectively. Along with these two big parties, Nigeria could, for the first time, also see a powerful third party emerge in 2019. The most popular phrase in the country today is “Third Force” and various groupings are attempting to harness the appetite for an alternative to the APC and PDP. 30 opposition parties have joined forces under the banner of the Coalition for a New Nigeria (CNN). Former president Olusegun Obasanjo has helped set up the Coalition for Nigeria Movement (CNM). And groups such as the Nigerian Intervention Movement, Revive Nigeria and Emerging Leaders’ Summit are also trying to jostle for position. Regarding the presidency, the likes of motivational speaker Fela Durotoye, former deputy governor of Central Bank of Nigeria Kingsley Moghalu, and founder of the online whistleblowing site Sahara Reporter Omoyele Sowore have all expressed their intention to challenge the main parties’ candidates. At the same time, citizen-led groups are also making their voices heard. The Red Card Movement, led by former minister and #BringBackOurGirls campaigner Oby Ezekwesili, is calling for the APC and PDP to be “sent off”. Meanwhile, the Not Too Young To Run movement is demanding the inclusion of young people in the political space. Unfortunately, there is less momentum behind efforts seeking to enhance the participation of women in politics. Less than 6% of Nigeria’s lawmakers are female, one of the lowest proportion in Africa, and while more marginal parties may make space for women and youth to lure voters, the same is likely to be less true of the big parties. One of the biggest issues that will determine the 2019 general elections is insecurity, which is affecting communities across the country. Ongoing instability could affect the vote itself and will certainly be a big issue on the campaign trail. On Boko Haram in the North East, the APC will claim to have successfully tackled the insurgency. The PDP and other opposition parties will argue against this and likely emphasise the dire humanitarian situation. The candidates may try to woo internally-displaced persons as the election nears. Another matter will be the conflict between herders and farmers, which has arguably become Nigeria’s most pressing internal security threat. As hundreds have died in clashes over land disputes in a dozen states, the Buhari administration has been criticised for its poor handling of the issue. The conflict – and lack of accountability for heinous crimes – predates the APC’s rule, but its severity and death toll have escalated in recent years. In the South East, Biafra separatists continue to call for independence. The most prominent voice in this is the Indigenous People of Biafra (IPOB), whose leader Nnamdi Kanu has been missing for several months. The group has vowed that no election will take place in the south east until a referendum on secession is called. Finally, gang violence has resulted in several deaths recently, particularly in the Niger Delta and South-South region. Worrying, these groups are often instrumentalised by politicians around elections. The economy will be another crucial issue. Nigeria is still suffering from a fuel scarcity, while the economic downturn continues. When Buhari came into office, the price of dollar was around N170. Today that figure is closer to N360. Nigeria exited its first recession in 25 years in the second quarter of 2017, but growth remains sluggish. The country continues to depend on oil, while un- and under-employment have increased notwithstanding the administration’s novel social intervention programmes (SIP). Buhari rode to victory in 2015 as the anti-corruption candidate, vowing to launch a war on graft. Corruption will once again be an important issue, but the incumbent will struggle to present himself as the same clean crusader this time around. While Buhari has embarked on some anti-corruption measures, critics note that his allies have avoided prosecution. Various of his associates have been fingered in scams, such as his chief-of-staff Abba Kyari, while the president has been perceived to have targeted his opponents. The uncoordinated approach taken by agencies in the fight against corruption have contributed to the fact that Nigeria has actually dropped 12 places from 136 to 148 in Transparency International’s Corruption Perceptions Index. As in politics and elections across the world, social media is set to play a major role in Nigeria’s 2019 campaign. In the 2015 elections, hate speeches and misinformation spread far and wide, with Buhari targeted in particular. After the elections, incredible rumours and lies continued to abound, to the extent that there were even allegations that the man that eventually returned from London after prolonged illness was not in fact the real Buhari, but a cloned version from Sudan. Ahead of the recently concluded Anambra governorship elections, we saw another example of how fast-spreading misinformation could almost skew a process. Rumours emerged on social media that soldiers had invaded schools in Ozobulu, Anambra State, and were forcefully injecting pupils with poisonous substances that cause monkey pox. This led to the shutdown of schools in Imo, Enugu, Abia, Anambra and Ebonyi state and even affected Rivers and Balyesa states. The false story was said to have been posted on the Facebook page of the IPOB, which had vowed to disrupt any elections in the region. Nigeria’s social media space is generally highly susceptible from manipulation by influential individuals with vested interests and little sense of electoral ethics. They are ready to confuse or divide people along ethnic, religious or other lines to serve their own ends. In 2015, the PDP recruited Cambridge Analytica. In 2019, those with sufficient resources may again solicit the services of international PR firms with records of employing questionable methods. South Africa: following the North African path? Atiku is a democrat and a great leader/mentor, One I strongly believe can wrestle power back to the good people of Nigeria from the sectional, regional and ethnic leader occupying the Aso Rock presently. We need a Nigerian as our President not a Southerner or a Northerner and The Waziri Adamawa is the man because he’s the most qualified and prepared to unseat the under performing Apc/Buhari led government and the best candidate amongst those mentioned above.